As the title states, this is a non-spoiler theory. So why have I came to such an unusual conclusion? well, this is the factor that came into play. The Master of Masters created Chirithy. A Dream Eater. As everyone knows, Dream Eaters can only exist in the Realm of Sleep. Artificial Dream Eaters are an exception to the rule because they were created and birthed in the real world. But what has this got to do with the Fortellers? well, what if the Master of Masters artificially created them too? Here are a couple of things to note with regards to the Master of Masters. In the trailers, the Fortellers rendezvous point is like a lab of sorts. With flasks, test tubes and books on books on books. He may have wanted to create the Fortellers as a means of better understanding the context of future events. After all, he does have the all seeing eye that can see into the future, and so he may have wanted to create the Fortellers as future-proofing himself for the inevitable. Plus, if we look at the Fortellers, what's the key element that stands out? their masks. They're symbolic of animals. Now, it's easy to connotate those masks with the Seven Deadly Sins, but I think a more simple explanation is that they're Dream Eaters. Now with regular Dream Eaters (with the exception of Chirithy, Riku and Ventus Nightmare), the majority are a mix of two animals or more. The Fortellers can still fit that category? why? because they're a mix of a human and the mask that they wear, for example, Ava is a human + fox Dream Eater. Plus, it makes contextual sense of why the Unchained Realm exists in the first place, Spirit Dream Eater Ava has created it to let the Dandelions live on outside the Keyblade War, and as a Dream Eater, her and the other Fortellers' can also survive the Keyblade War as "Lost Masters" if the world where the Keyblade War took place stayed in slumber. I think your on to something with your theory there...kinda like what they did with the design of the nobody's in org 13. 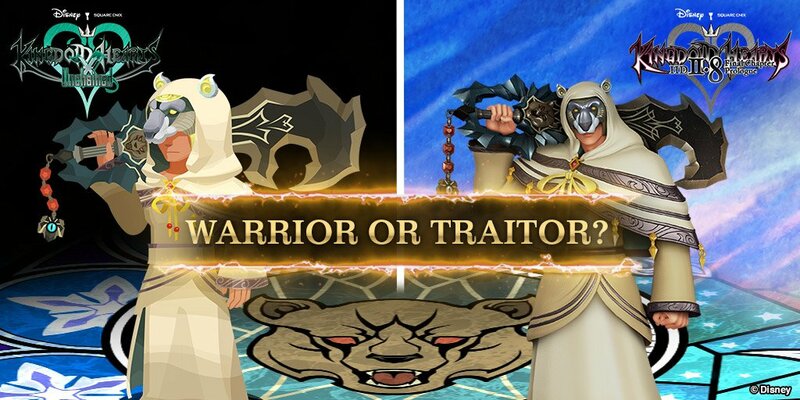 Even better proof: both Chirithy and the foretellers have capes of some sort. Who's to say they aren't hiding something there too..? I think youâ€™re on to something with your theory there...kinda like what they did with the design of the nobody's in org 13. It was a lightbulb idea if anything. But it can give further context between Aced and Iraâ€™s rivalry. Aced may be bitter against Ira, because, Heâ€™s the purest Spirit out of the bunch. Really think about it, out of all the Fortellerâ€™s, heâ€™s the one most concerned about the light. And what are Nightmares associated with? The darkness. Having Ira be a Nightmare Dream Eater would contextualise the rivalry between the two better. Exactly, their Dream Eater Sigils are presumably engraved in the back of their clothing. And when it comes to the â€œReincarnationâ€ theory to begin with, it was partly made because of the similarities with the Keyblade heroes. Who else has similarity with heroes? Dream Eaters. For example, Meowjesty is a straight colour rip of Mickey Mouse. Thereâ€™s no Reincarnation link between Mickey and Meowjesty (barring the obviously reasons of legality), but thereâ€™s an undeniable fact that Meowjesty is â€œinspiredâ€ off Mickey and nothing more. Just like how Ava is inspired by Kairi, Gula is inspired by Roxas, Aced is inspired by Terra, Invi is inspired by Aqua and Ira is inspired by Riku. Nothing more than visual similarities as Dream Eaters. I honestly dig it. Good work, Baymax. Cheers Muke. This theory can also be used to identify the traitor as Ira, not because he wants to be a traitor, but the Master of Masters created him as a Nightmare so he goes against the ethos of the other Spirit Dream Eaters by default. Plus, when Gula read the lost page, he found that the traitor can be identified with the Recusant Sigil. Clearly, there's no "X" on any of the robes, so I feel as though that the Recusant Sigil that the Master of Masters is talking about is the Nightmare Dream Eater emblem. It does make a heap of sense in a way. I saw another non-spoiler theory that other day that maybe the Master uses the keyblades with eyes on them to glimpse into the future, which could explain why the foretellers were made to resemble them. Then there's the capes they wear, and the possibility of humans being dream eaters like Riku. It lines up pretty nicely. Iâ€™m glad you like it too. To clarify with the theory, this has got absolutely nothing to do with the Reincarnation theory, which is fantastic news, considering that the Fortellers can still stick to being original characters. However, I never really thought it through to the extent of the dream piece shards. Nice analysis there. That could perfectly explain as to why they are fashioned in the way they are fashioned. Plus, when you think about it, Ira being a Nightmare makes sense if heâ€™s fashioned from Riku, specifically, Kingdom Hearts 1 Riku. In that game, Riku submitted to the Darkness willingly. And during a period of time, he had total control of it whilst retaining his personality. The Master of Masters may have used that iteration to create Ira, and as a consequence, he became a Nightmare. Now people may bring the counter-argument that, Terra willingly used the Darkness in Birth by Sleep. However, I counter-argue that the context in which it was used was different. Terra didnâ€™t intentionally use his Darkness in malicious way like Kingdom Hearts 1 Riku did, he was either manipulated to use it or used it out of desperation to protect his allies. Terra was still a good guy at heart hence why Aced was a Spirit and not a Nightmare. Just like how Ava is inspired by Kairi, Gula is inspired by Roxas, Aced is inspired by Terra, Invi is inspired by Aqua and Ira is inspired by Riku. Nothing more than visual similarities as Dream Eaters. Don't you mean Gula is inspired by Ventus? Roxas was never supposed to exist and is strictly spoken a new hybrid being created from both Sora and Ventus. I'd be cautious with already strictly identifying Ira as the traitor (or sole traitor for that manner) except of course if you're already fully spoiled on Back Cover and know this to be the case (but then it should be wrapped in spoiler tags, shouldn't it?). I'm not sure if the red eyes on Ira's mask can be definitely used to identify him as a Nightmare nor that the yellow eyes on the other four can for them being spirits, as Spirit Dream Eaters can also have blue, purple or green eyes. I'm actually wondering about this particular part. If Gula managed to read the whole lost page it explains his statement from the very first 2.8 trailer that the lost page states that there is one who will betray all, it doesn't explain though as to why it was apparently Ira who made the whole issue about there being a traitor public for which Aced chewed him out. So either Gula informed Ira which is unlikely considering his lone-wolf attitude and also since he couldn't rule out Ira being the traitor, or Ira must somehow got to some information regarding the issue in another way. The Recusant's Sigil is strictly spoken an X (or St. Andrews cross), yet we do not know if it works only if it is the plain thing or if it works also as part of a bigger symbol. The Heartless Emblem, Unversed Symbol and the Nightmare Dream Eater sigil all do feature an X in their design somewhere, so they could possibly count as a Recusant's Sigil. Having parallels and being inspired by something is still a totally different pair of shoes, hence why I admit that I too like this prospect about 99 levels more than the whole Reincarnation/otherwise appearance-clones theories that have been brought forth. The counter-argument of Terra "willingly" using the Darkness in BBS doesn't work actually as Terra never consciously called on the powers of Darkness and actually wanted to use them, the powers just flare up and get released when Terra is sufficiently enraged or emotionally unstable. He even admits himself that he only succumbed to the Darkness. Terra never had any measure of control over his own Darkness, which also shows with how ragged and unsteady his dark aura is when it flares up compared to Riku. Riku in KH 1 on the other hand did willingly jump into the Darkness and consciously wanted to use it which is a huge difference to Terra. The latter scarring Braig in battle with Darkness or using it to pummel Eraqus into a state where MX could easily finish him off were all largely unintentional use of Darkness while Riku attacking the Beast or blasting a Dark Firaga at Sora were fully intentional on his part. So in this regard I do concur that Ira being a nightmare would make some sense. True, nobodies arenâ€™t supposed to exist, however, they do have hearts do they not? (after all, Ventus Armor Nightmare was Ventus Armor being under the influence of Nightmares and not Ventus so whether something "exists" or not isn't the determining factor of a Dream Eater's birth). And when it comes to the character description of Gula, itâ€™s far more fitting of Roxas than Ventus. Roxas was a lone wolf by circumstances (for example, being the only real being in Virtual Daybreak Town or the unwillingness to be associated with the rest of Organization XIII agenda). The Masters of Masters may have wanted to fashion a Dream Eater out of Roxas because of his hybridity. Despite Roxas being Soraâ€™s nobody, his talents, powers and motivation are distinct enough for him to be classified as an individual being (even if that being is a Nobody). Plus, if we take into consideration that Sora is the â€œordinaryâ€ one, the Master of Masters may have seen that as too much of a liability hence why fashioning Gula from Roxas would have been preferable. Iâ€™ve spoilt X Back Cover for myself, and I can happily say that this theory does not spoil or ruin the movie nor does it get debunked either. As far as pointing it to a single character, Iâ€™m using â€œtraitorâ€ in the context of â€œthe odd one outâ€ as opposed to â€œintentionally evilâ€. True, but the default colour for Spirit eyes are yellow and the default colour for Nightmare eyes are Red. With Gula knowing about the lost page, the only person he tells it to is Ava because he sees her as a confidant. So basically, Gula and Ava are the only ones to know about the traitor and their Recusantâ€™s Sigil. Aced, Invi and Ira are completely unaware of the traitor being linked with the Recusantâ€™s Sigil because Gula hasnâ€™t told them (yet). But good job linking the sigil with the enemy creature emblems. I never came to realise that fact. Yeah, truth be told, the Reincarnation theory was invented before definitive characterisation of the Fortellers was revealed. Kingdom Hearts is full of parallels, but because these are â€œMastersâ€ from the distant past of Kingdom Hearts timeline, I feel that a direct link with the heroes may not make as much contextual sense compared to this theory, because unlike the artificial Dream Eater theory, thereâ€™s no suitable plot device for Reincarnation to occur in the first place. Having them be Dream Eaters on the other hand makes a lot of sense if Dream Eaters like Chirithy can exist in the real world, and with the way that the Unchained realm is described, it sounds like a Dream World. My bad, I thought about it from a gameplay perspective too (with the dark attacks, D-Links and dark Keyblades he has in his arsenal). But fact of the matter is, youâ€™re completely right with Terra and his experiences with darkness. They werenâ€™t intentional if you exclude gameplay mechanics. Riku in KH 1 on the other hand did willingly jump into the Darkness and consciously wanted to use it which is a huge difference to Terra. The latter scarring Braig in battle with Darkness or using it to pummel Eraqus into a state where MX could easily finish him off were all largely unintentional use of Darkness while Riku attacking the Beast or blasting a Dark Firaga at Sora were fully intentional on his part. So in this regard I do concur that Ira being a nightmare would make some sense. Exactly. And out of all the protagonists in the Kingdom Hearts series, Riku is the most associated and experienced with darkness to the point where heâ€™s mastered it to his advantage. If Ira was to be fashioned by Riku, clearly, there would be an imprint of darkness within him because that was part of Riku character, his association with darkness. But because of that darkness imprint, that goes against Iraâ€™s role of being a Forteller that extinguishes the darkness. A traitor by design and not intention. Play the games in release order it will blow your mind. (25 char minimum). Correction: They can form a heart but they start out with none. The Armored Ventus Nightmare was an already existing Nightmare though, the one that held Sora's heart captured in Darkness and would have engulfed him fully if the armor wasn't there. So the armor got possessed by the Nightmare instead. But what does it matter that the description "matches" Roxas more when the Foretellers are their own things only partly inspired by existing characters. In terms of parallels Roxas is also totally out of place in that group as he has close to nothing to do with Kairi/Riku and Terra/Aqua. Where do Xion, NaminÃ©, Lea/Axel and Ven then fit into the whole mold? It is a no-brainer that Roxas is fully his own individual, but that also isn't the main crux of the issue. This is all conjecture anyways, but when looking at from the flip side why would the MoM choose specifically Roxas out of all the available candidates left to base a Dream Eater on? From what I've read about Back Cover Gula is actually a rather smart individual who arguably works like a Private Investigator...Roxas on the other hand was most of the time clueless about things and not really the sharpest tool in the box. I've read a summary about the movie and from what I read I can say all of them act "odd" at some points during the movie, lol. Can't really argue that as I've forgotten if Spirits really all start with the yellow "stance" or not. Chirithy certainly doesn't though as his/her eyes seem to be blue-greenish. All fine and dandy, yet that still doesn't explain how Ira came to know that there IS supposedly a traitor at all and could blurt it out to all the others in public if the very fact that there IS even a traitor is also only on the Lost page. Gula actually informs Ava of that? There must be certainly a measure of trust between them for that to happen (except if Gula is also one of those who doesn't believe that the traitor is actually one of their core group of five). Also, from the summary I read I got the impression that Gula isn't even sure what exactly the Recusant's Sigil looks like, further increasing the difficulty of his efforts to find and unmask the traitor. Thanks, I came to that idea because you mentioned the traitor possibly being a Nightmare Dream Eater. If the Recusant's Sigil does not have to be plain (meaning ONLY the X) but can be integrated into something else, all these enemy creature symbols are eglible. In this case, Ansem SoD in his non-robe guy appearance would also always carry a Recusant's Sigil. True dat, if I remember right it was based mostly on clothing colors and some parts of the Xehanort Reports which spoke about the different "factions" of the Keyblade War. Indeed, parallels require much less visual cloning and can still bring over a sort of connection without overdoing it. Well, the prospect of the entirety of X[chi], Unchained Chi and thus also Back Cover taking place in a dream world isn't really new, and considering some oddities and differences that happen a multi-layered dream is also not unlikely to be in place, so the Dream Eater idea can be much easier and more simply connected to the whole setting. Sora can also use Dark themed Keyblades (Oblivion, End of Pain) in terms of gameplay, that's why I generally exclude gameplay elements in such assessments. We're talking from an in-universe viewpoint here and not on meta-level. In-universe Ventus was there first, he was even there before Sora himself. Late to say, but the theory in the first post is pretty good imo. Good work Baymax. This is a great theory! But it kinda does make since for them to be Dream Eaters when you think about it. But a hole boils down into it in the end. Spirits and Nightmares are bound to the user they are with, and that would mean they would have to be bound to someone. The Master of Masters "vanished, faded, away" and Luxu is just dragging a box around in a desert. So they might not be bound to anyone, or they where normal people at first. But for the Master to probably have them surpass limitations of a normal Keyblade Wielder with almost no effort, thus is why someone like the Player hardly does any sort of damage to them. But what I said should be taken with many grains of salt. But it seemed no one was the traitor, perhaps if they removed the mask we could tell for sure...Seriously, we need face reveals! Out of curiousity, what about the line about what nightmares are supposed to do according to nightmare Chirithy? He says that they're supposed break bonds to live freely. Ira definitely breaks ties with Aced by the end of Chi, but if anyone is breaking ties I'd almost say it's Gula? By the end of Chi he was pretty much homeless and only cared about Ava. The thing is though, when it comes to parallels, itâ€™s parallels of individualâ€™s and not group. If Gula was fashioned out of Ventus, thatâ€™d complete the Land of Departure trio but not the Destiny Islands trio, likewise, if Gula was fashioned out of Sora, thatâ€™d complete the Destiny Islands Trio and not the Land of Departure trio. By having Roxas, thereâ€™s an equivalent balance. Of course, thereâ€™s the counter-argument that thereâ€™s no-one representing Xion or Axel, however, Xion is a Roxas replica and Axel only wielded the Keyblade through Merlinâ€™s compressed training after he became Lea. Roxas is Soraâ€™s nobody and takes the visual appearance of Ventus hence itâ€™s an equivalent representative of the Land of Departure trio and Destiny Islands trio. Roxas may be unaware but he is by no means outright dumb. Choosing Roxas is ideal because, not only is he a combination of elements that comprise of both Sora and Ventus, but, thereâ€™s also a spoiler related link to it too. Gula and Ava have a strong connection with each other on a personal level to the point where Ava is willing to sacrifice her life for Gulaâ€™s safety. If we presume that Ava is fashioned from Kairi and Gula is fashioned from â€œSoraâ€™s nobodyâ€ (yes, Iâ€™m intentionally not saying Roxas), the connection, whilst coincidence, is coincidence by design of the Master of Masters. Iâ€™m pretty sure thatâ€™s more to do with storytelling purposes if anything. Itâ€™d be a pointless movie if there was a â€œdead giveawayâ€ as to who the traitor really is. Chritihy is an exception as a Dream Eater to begin with because itâ€™s not a hybrid animal. Itâ€™s solely based off the Scottish Fold breed of Cats. Well, if we go outside the Dream Eater theory and take the Reuscant Sigil at face value, Luxuâ€™s name has an X in it. It can be easy to assume that heâ€™s the traitor because heâ€™s behind the scenes and wearâ€™s the Black Coak. However, I personally feel as though the traitor is exclusive to the Fortellers. After all, they were given a Tome of Prophecy whilst Luxu has a completely alternate task (and was not branded as a Forteller). And keep in mind, Kingdom Hearts X was officially announced in 2013. A year after Dream Drop Distance. That means that the concept of Dream Eaters was still fairly fresh in Nomuraâ€™s mind. And unlike the Unversed, they werenâ€™t just throwaway enemies, theyâ€™re plot related beyond a singular Kingdom Hearts game. I think youâ€™re getting Dream Eaters in general confused with Chirithy. Yes, Chirithy is a Dream Eater, and Chirithy is bound to the player but thatâ€™s only because they were artificially designed by the Master of Masters that way. Regular Dream Eaters whether they be Spirits or Nightmares are completely wild animals. With this theory, I propose that the fortellers are bound by the Master of Masters hence their loyalty and dependence for him (plus, his habit of patting Ava and Invi on the head like they were pets may also allure that hint too). And as far as the whole face reveals go, I really donâ€™t think thereâ€™s any â€œface revealsâ€ to begin with because those masks are their faces. Like I mentioned earlier, the majority of Dream Eaters are a hybrid of two creatures. Gulaâ€™s different because heâ€™s not intentionally breaking ties, heâ€™s just very apathetic and lackadaisical. Itâ€™s part of his lone wolf character. As for confiding with Ava, I donâ€™t want to be â€œthat guyâ€ and say itâ€™s for shipping reasons, but, I feel as though him being fashioned from Soraâ€™s nobody (Roxas) and Ava being fashioned from Kairi warrants the connection that these two still maintain. That connection imprint may have carried over just like how the imprint of Kingdom Hearts 1 Riku and his darkness imprinted over to Ira. Plus, both of them are the youngest and closest to age with the wielders so itâ€™s easier for them two to confide in each other as teens. The official Twitter page for Kingdom Hearts provided this as promotional material for X Back Cover. The account states, "Ira (Unicornis) was chosen by the Master to be the leaderâ€¦but where is he leading the other Union leaders?". Also, notice how his eyes are intentionally still yellow for his X/Unchained X character model yet it's red for X Back Cover.